Green Ox Standard Corrugated Pallets are designed to industry standard pallet dimensions (48×40) and can handle the majority of the load weight shipments in the U.S.(1) In addition to offering 48×40 pallets for land transportation, our standard pallet line also includes a 48×40 air freight pallet designed for air cargo shipments. 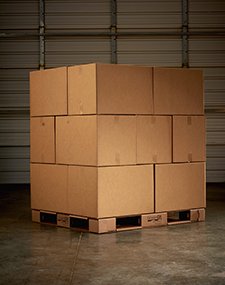 Green Ox Standard Corrugated Pallets are rigorously tested both by our internal testing lab and an independent ISTA-certified laboratory, assuring pallet performance, product delivery, and supply chain continuity. In addition to our internal and third-party testing, we also have clients perform their own tests specific to their product, load weight / distribution, load configuration, shipment type, unification, and pallet use. Green Ox Standard Corrugated Pallets can be manufactured anywhere with delivery options that meet just-in-time provisioning as flat or assembled pallets in any size and quantity. (1) Recommended load weights are evaluated on a case-by-case basis based on load weight / distribution, load configuration, shipment type, unitization, and pallet use.